If human experience has shown one thing, it is this: No human government has been able to achieve lasting peace or prosperity! Why? WHY HAVE human governments failed throughout history? Why have they been unsuccessful in achieving the two chief goals they set for themselves: peace and prosperity? 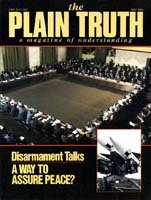 The answer to this enigma was formally addressed by Plain Truth editor in chief Herbert w. Armstrong at a unique conference in March 1977. The conference was held in Windhoek, the administrative center of South-West Africa, also known as Namibia. Eleven delegations from the 11 population groups that make up the 900,000 inhabitants of South-West Africa/Namibia were gathered in the historic Turnhalle assembly building in Windhoek. Their objective: to forge a just constitution for their country. A former German colony, South-West Africa / Namibia has been governed by the nation of South Africa since 1920. It was scheduled to receive its independence at the end of 1977. The "Turnhalle conference" was first convened in September 1975. It had been compared by some to the convention that wrote the United States Constitution nearly two centuries earlier. Mr. Armstrong was the first foreigner and religious leader invited to speak to the assemblage. More than 40 delegates and other high ranking officials gathered for his address. Mr. Armstrong began by reviewing before the delegates the entire span of human history. He explained from the Bible how the great archangel we know as Lucifer (who became Satan) rejected the government and the law of God. And how, later, the first man, Adam, rejected the way of God and chose to follow the way of Satan. He related also how Adam's descendants, cut off from contact with God, have chosen instead to pursue their own way — the self-centered, competitive way of "GET" — rather than the God-centered, outgoing way of " LOVE" or "GIVE." "This is the background that has led up to today and all of its evils," Mr. Armstrong summarized. He observed that God, in effect, sentenced Adam and his descendants to form their own governments, based on the "GET" principle. Throughout history the human, civil governments, he said, have become a punishment for rejecting God's divine government! Mr. Armstrong then told the assembled delegates they had the unique opportunity to form a human government more nearly based on God's way of life — the way of outgoing concern for each of their 11 population groups, of serving, cooperating and sharing for the good and welfare of others. "God help you to do the best job that can be done and to form the finest government that has ever been formed in the history of mankind on this earth," Mr. Armstrong exhorted the conference. This should be a government, he added, that would be fair and just for every person, without regard for race or other considerations. Events in the aftermath of the Turnhalle conference did not proceed in the way its delegates had hoped. Guerrilla warfare escalated. Current talks on the future of the diamond — and uranium-rich territory are now stalled. South-West Africa/Namibia remains in a state of political and social ferment. Unfortunately, this scenario fits well into the sorry, near 6,000-year record of man's history. In recent times, as in ages past, man's attempts to come to grips with the problem of government have been thwarted by problems beyond human capacity to control. For millennia, leaders of honesty and integrity have tried to grapple with the immense problems of government. These men have tried to find responsible solutions, have tried to make the world better. But forces seemingly beyond their control have frustrated their efforts at every turn. Regardless of their methods of achieving them, governments claim to have the same basic goals. The primary aims of human government are peace and prosperity, often collectively referred to as the "common good." Through history, governments have set about achieving these objectives in many different ways. But no government in history has ever achieved these dual aims fully, or permanently. None has achieved lasting peace and prosperity. All human governments have, at some point, failed! Instead of peace, mankind has known in almost every generation war and violence. War has been the way of history. There have been well over 15,000 wars throughout recorded history. Some 100 million people have died in wars in this 20th century alone! Instead of prosperity, the vast majority of human beings have known nothing more than slavery or ' wretchedness and squalor. Prosperity for the few, poverty for the many has been the age-old rule. The world's problems — today and throughout history — are a stinging indictment of the world's systems of government! In fact, governments, more often than not, have created more problems than they have solved! Man has proven his utter incapability of ruling himself! Why should this most gifted of God's physical creatures have failed so miserably? There is a definite cause — a clear cut reason why governments have fallen so short of the mark. Governments have failed simply because they don't know how to succeed! Mankind has rejected the only knowledge that would allow its governments to succeed — the knowledge of God and his way! Mankind simply does not know the way to peace and prosperity (see Isaiah 59:8). Man, separated from God, is incapable of understanding the requirements for peace! Understand this: The world's problems are essentially spiritual in nature. They have a deep rooted spiritual basis. They cannot be solved through the use of mere physical knowledge alone. In rejecting the knowledge of God, man has had to rely on his own philosophies — on humanly devised approaches that appear right to him. He has failed to heed a vitally important biblical admonition. Read it for yourself in Proverbs 14:12: "There is.a way which seemeth right unto a man, but the end thereof are the ways of death." Man has chosen to pursue his own way, the way that seems right to him. He has rejected God as his ruler. Even God's own chosen people cut themselves off from him by sin. Nations today are not imbued with the gift of God's Holy Spirit, which would open their minds to comprehend spiritual knowledge and give them the power to restrain human nature. It is mankind's Satan — seduced nature — of vanity, jealousy, lust and greed — that prevents man from achieving a world of lasting peace and prosperity. Mankind has utterly failed to bring that nature into rein. The human factor is the unrecognized seed of destruction within every form of earthly government. Man's governments are inherently imperfect because man is imperfect. An additional factor compounds the problem even further. Not only does unrestrained human nature disqualify man from ruling human nature doesn't want to be ruled! Satan's attitude of defiance and rebellion permeates this world. In recent years, the world's governments have been toppling at the rate of one each month! In this world, the only check on human nature is human nature itself. One man's lust for power is equalled only by another man's greed to keep it. The result: civil strife, chaos, struggles for political power, war. Man's attempts to do it his own way, apart from God, have proved utterly disastrous! Unrealized by many, the Almighty God of the Bible is not the "god of this world"! Throughout history, the Creator God has generally kept hands off — with the exception of those occasions when divine intervention has been necessary for accomplishing his purposes. God is permitting the world to go its own way, to learn for itself that Satan's way of rejecting the law and government of God can in the end bring nothing but disaster. That bitter lesson has been written in blood, suffering, unhappiness and death! The record of history makes abundantly clear that this is Satan's world! The "god of this world," your Bible reveals, is Satan (see II Corinthians 4:4). This world is under Satan's rule, not God's government. Jesus Christ has qualified to unseat Satan as ruler over the earth (Matthew 4:1-11), but he has not yet returned to earth to assume the throne and establish God's kingdom over all nations. In the meantime, God is allowing human governments to function (Romans 13), for the primary purpose of maintaining law and order (see verse 4). God will not allow anarchy. But God also places definite limits on these human governments. This world's governments do not have unlimited authority! When governing authorities abuse their power and overstep their bounds, coming into conflict with God's laws and prerogatives, God's laws must clearly take precedence. "We ought to obey God rather than men," the early apostles declared (Acts 5:29). The Bible teaching is clear: As individuals, we must be subject to the humanly devised laws of the land — and when human laws are contrary to God, we must obey God and suffer whatever penalty men impose. Satan has continually used civil governments to oppose God's way and God's purposes. But Satan's days of seducing the nations are numbered! Jesus' gospel is his message. Jesus Christ, the Messiah, was a messenger. He brought to mankind the "gospel [meaning 'good news'] of the kingdom of God" (Mark 1:14) — a message about a literal, world-ruling government, soon to be established! The gospel is an announcement — a proclamation that the imperfect, humanly devised governments of this world are to pass into history, to be replaced by the world-ruling perfect government of God. At the climax of man's rebellion against God — in the impending period of global chaos and war, "the God of heaven [shall] set up a kingdom, which shall never be destroyed... it shall break in pieces and consume all these kingdoms [this world's present governments], and it shall stand for ever" (Daniel 2:44). This good news is also described in Revelation 11:15: "And the seventh angel sounded; and there were great voices in heaven, saying, The kingdoms of this world are become the kingdoms of our Lord, and of his Christ; and he shall reign for ever and ever." Moreover, Jesus Christ is not going to do this ruling by himself! He is coming to set up a highly organized WORLD GOVERNMENT, with many positions of authority — positions which will be filled by former humans who have qualified for resurrection to eternal life! The perfect law of God will become the very cornerstone of the kingdom of God (Micah 4:1-2). Satan and his demonic cohorts will be bound and imprisoned, that they "should deceive the nations no more" (Revelation 20:1-3). Man's very nature will be changed! "And I will give them one heart, and I will put a new spirit within you; and I will take the stony heart out of their flesh, and will give them an heart of flesh," God declares (Ezekiel 11:19). Man will be given God's Holy Spirit — the power to overcome his nature, and the power to comprehend spiritual knowledge. After about 6,000 years of human history, the way of "GIVE" will at last replace the way of "GET." Significantly, one of the major signs cited by Christ himself of the nearness of the end of this present age is that the gospel announcement would be proclaimed worldwide. Notice Matthew 24:14: "And this gospel of the kingdom shall be preached in all the world for a witness unto all nations; and then shall the end come." You are now hearing that announcement through the pages of the Plain Truth magazine and on the World Tomorrow broadcast. And the kings, presidents and prime ministers of this world are personally hearing it from Herbert W. Armstrong, editor in chief of The Plain Truth and apostle of Jesus Christ. Yes, there is a perfect government. It is the government of God! If you want to know more about this coming government — and your potential part in it — read our free booklet The Wonderful World Tomorrow - What It Will Be Like. A new age is coming! This "present evil world" (Galatians 1:4) is soon to pass away. In the end, all nations will learn the great lesson that God's government is the only way that will produce the peace and prosperity that all peoples seek!